Makes No Time for the Beach! You might have noticed I didn't publish a September eNewsletter but that doesn't mean that I was lounging poolside or sunbathing at the beach! Ha-ha...I wish! 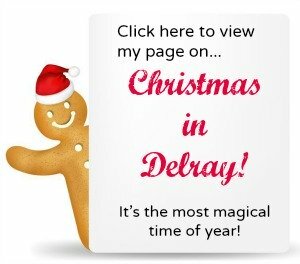 I've been very busy working on new projects to deliver you even more (virtual) Delray Love! Behind the scenes, my website hosting upgraded their software, which in turn meant that I needed to upgrade all my web pages to the new software. With nearly 200 pages, this was no easy task. 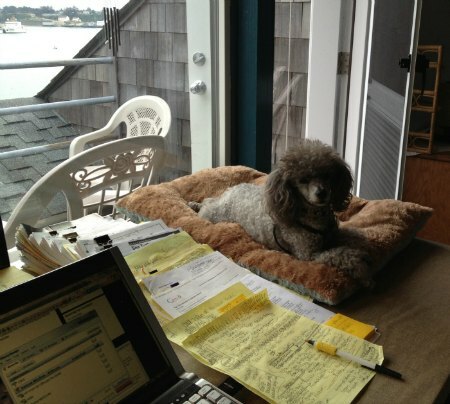 I get the stack of work to do, while Prince Pierre gets the fluffy dog bed to lounge on. While in Oregon, I had an amazing view! Take a look at this sunset in Newport, Oregon. This was my view every day from my desk. While I was switching over all my web pages, I decided it was also a good time to "update" some of the pages on my website. So I've deleted outdated pages and outdated information and I've combined some pages that were of similar content. I'm still working on the last few. Overall, this should make it easier for you to navigate my website and find exactly what you're looking for. I'm working on a few different eBooks that will be released spanning over the next couple of years. 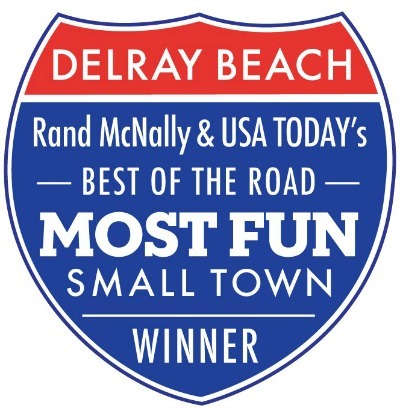 They, of course, will be all about Delray Beach, FL! And, that's all I'm going to say about it for now as I want them all to be a big fat surprise! Here's what's important for you know right now! Prior to a public release (via Amazon.com, social media, my website, blog, etc. ), I'll offer you, my valued eNewsletter subscriber, the very first sneak-peek preview -- for free! And, additionally, I'll offer you the opportunity to pre-purchase them at a huge whopping discount! 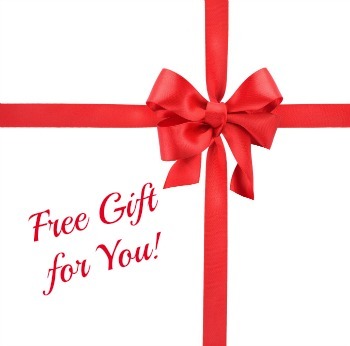 This select offer is only available to my eNewsletter subscribers. Before I release the eBooks publically, you will have the elite privilege to pre-purchase the eBooks at a screaming discount! The discount will usually be 50% (or more!) off regular price -- for a very limited time period of 3 days only! Whenever a new eBook is available, I will send out a special eNewsletter announcing it. You will need to read these special eNewsletters immediately as you will only have 3 days from when I send them to take advantage of the special pre-purchase price! As promised above, you get the very first sneak-peek preview of this book! NOTE: Be sure to watch for the email soon that allows you to pre-purchase it at the screaming discount of 50% (or more!) off regular price! Your feedback and comments are important to me, and this is why I've created a contact link on the very last page. After you're done reading it, (it's only 4 pages), please do me a really big favor, and click on the contact link at the end and shoot me a quick little note. A few words, or a few sentences, either way, it's all appreciated! Thank you in advance! P.S. The eBook is in PDF format. This means it is formatted in a universal reading format that allows it to be read on any kind of device (iPad, computer, phone, etc). If you do not have a PDF reader on your device, you can simply download one for free right here. The eBooks can be read online or printed directly from your computer. From the Night of the Living Dead! 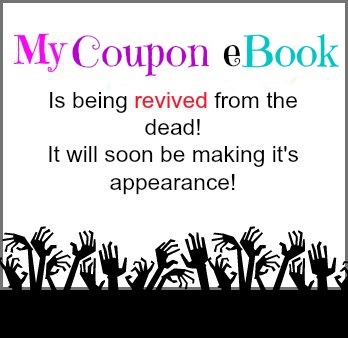 I'll be compiling a coupon eBook to offer you the best coupons and discounts I can find from local businesses throughout Palm Beach County. Look for it to be out in about a month. And, as promised above, my subscribers will see it first and get the screaming discount of 50% off! 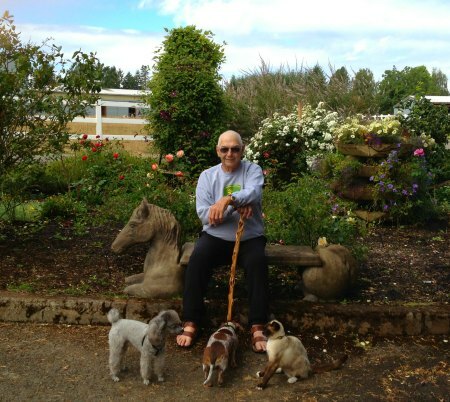 You may remember, I started my coupon eBook last year, but due to my father being diagnosed with two different diagnoses of cancer, and then shortly afterwards, needing open heart surgery, I decided to delay publishing it and instead, off to Oregon I headed to be with my dad. There were many times we didn't know if he was going to make it or not. Luckily, he's decided to stay with us here on earth awhile longer! Thanks Pop for staying with us! Throughout his multiple hospitalizations and surgeries, there were many frightful moments, but here's a couple photos of the better memories! 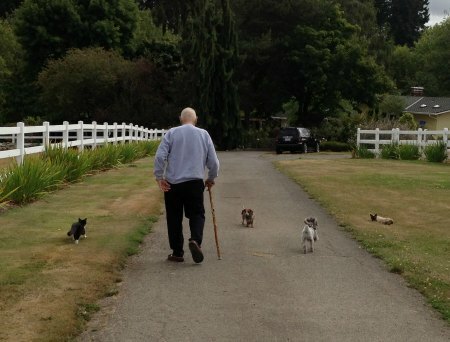 On his road to recovery, we would walk the driveway to help him slowly regain his strength. Of course, we always had followers too! And, as always, Prince Pierre was right by my side even when it came to my dad's rehab/recovery. The month of October is packed-full of events! October is the beginning of a brand new tourist season for us here in Florida and this means lots of events are just around the corner! Our Pineapple Grove Arts District is really growing with its own uber vibes! October 17, 2013, it will be host to our On The Ave event. It will be exciting to see On The Ave energy infused to the side streets of downtown. I'm looking forward to it! Hope to see you there. 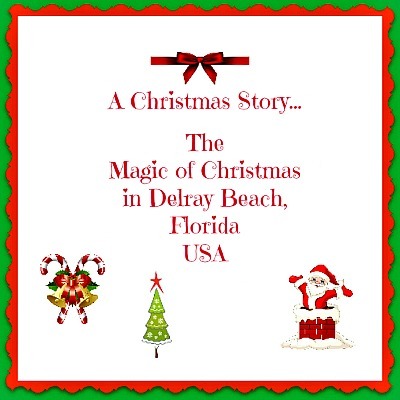 If you can't make it, I'll be sharing photos soon on I-Love-Delray-Beach.com Facebook Page! Halloween Fun has already started! We have two nearby pumpkin patches. One offers hay rides, corn mazes, a petting zoo, and more! Read all the details here. And then we have all-day Halloween Fun with Trick-or-Treating downtown, a small parade downtown, ending with a Family Fun Fest at Veteran's Park! You can view all of October Events here. Signature Events coming up that you won't want to miss! 1) On The Ave in Pineapple Grove Arts District! 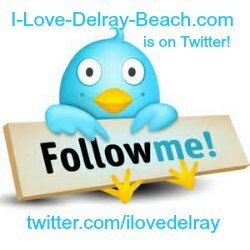 2) Delray Green Market opens this month! 3) Wine and Seafood Festival is in November! 4) Christmas Tree Lighting event in December! 5) First Night is our family-friendly New Year's Eve event on the Avenue. For quick delivery of info: Follow me on Facebook, Twitter or subscribe to my RSS feed for my latest Blog posts!